QUESTION: Yeah, thank you. There is a noticeable escalation of anti-Armenian rhetoric in Azerbaijan recently. Ilham Aliyev personally called Armenia a historic Azerbaijan land this time, which analysts qualified as territorial claim. The main question is about the violation of ceasefire recent weeks. Azerbaijan violated ceasefire not only in line of contact with Karabakh, but also across the state border with Armenia, severely shelling civilian rural settlements in northeastern part of Armenia. Some local authorities already have reported that full-scale war has already broken out. So as a co-chair of OSCE Minsk Group, do you follow the situation and any actions to put – do you put any efforts to restrain Azerbaijan from belligerent statements and action? Thank you. 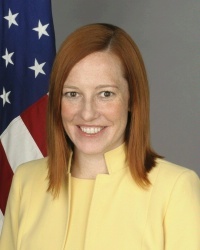 MS. PSAKI: Well, we are committed – as a co-chair, we’re committed to helping both sides reach a peaceful settlement to the Nagorno-Karabakh conflict. It’s our hope that the presidents of Armenia and Azerbaijan will accept French President Hollande’s invitation to hold a summit in Paris as soon as possible, and that they will agree to structured negotiations that will lead to a peace agreement. And we call on both sides to redouble their efforts at the negotiation table and to focus on the benefits that peace will bring to people across the region. Obviously, inflammatory rhetoric and statements run counter to the principle of reducing tensions, and so we certainly think that that damages the peace process, and that’s why we’re encouraging them to redouble their efforts. QUESTION: Jen, have you seen the reports that (inaudible) civilian settlements this time has been bombarded by Azerbaijan in Armenia? MS. PSAKI: I don’t have any confirmation of those specific reports, but clearly, a peaceful settlement is in the interests of both countries.